Cranberry juice is available throughout the United States raw or as a cocktail or juice blend. Although the raw cranberry juice is quite bitter, it has several benefits conducive to a healthy lifestyle. Nonetheless, other versions are available that also contain sugar or artificial sweeteners that may not have such a positive impact on your health. Cranberries are the main ingredients in all cranberry juice, although some commercial varieties will use cranberry juice concentrate. A concentrate has much of the water removed from the juice and later has water added to replenish and dilute the solution. 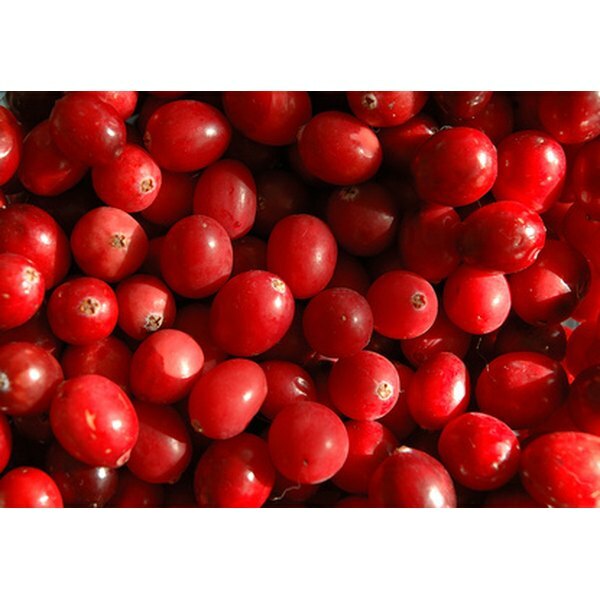 During this process, which usually requires the application of heat, many of the beneficial nutrients present in cranberries, as well as other fruits, denatures and becomes nutritionally bankrupt. Raw, unsweetened cranberry juice is the most beneficial, as it will have all essential vitamins and nutrients intact. Perhaps the most detrimental ingredient in cranberry juice, whether it be raw or processed, is the addition of sugar. According to the American Heart Association, women should consume no more than 100 calories a day from sugar, men no more than 150. An 8-oz. serving of cranberry juice usually contains 110 calories with 26 g of sugar. Cranberry juice cocktail can contain upward of 32 g of sugar per 8-oz. serving. Unsweetened raw cranberry juice may be tart, but it contains only about 90 calories per 8 oz. and only 12 g of sugar. If you can’t take the bitterness, adding a natural sweetener like rebiana may help to soothe your taste buds. One of the most notable and well-known health benefits of raw unsweetened cranberry juice is its ability to prevent urinary tract infections and encourage urinary tract health. Compounds present in cranberry juice help to prevent bacterial adherence to the bladder walls, which helps in the eradication of infection. Raw, unsweetened cranberry juice is also rich in phytochemicals that help to prevent free radical damage that can lead to cancer and cardiovascular conditions, although further research is necessary. Sugar-laden cranberry juice concentrate and juice blends are not healthy beverages. Instead, consume raw, unsweetened cranberry juice to garner its health benefits. Nadine Taylor, author of “Natural Menopause Remedies,” recommends drinking 8 oz. of cranberry juice a day as part of a balanced diet.